for two decades now, ever since may of 1995 when i was plotting my firstborn’s second birthday fete, and i flipped open the pages of my monthly infusion of delicious, gourmet magazine — before it was ruth reichl’s gourmet magazine, before it was defunct, folded into the crypt of long-gone magazines, magazines that shaped our culture and then withered and died, the sad fate of so much of what’s printed in ink on the page — page 200, the page where the binding is coming unglued, the page crusted with splatters of roux, it’s been my no-fail, last-ditch, best-hope-of-filling-a-hole-in-a-heart-by-way-of-the-belly cookery map. so it was yesterday, a crisp october day, when the sun poured in as if from a flask of molasses, so it was on a day when the boy who’d loped from the car at the school house curb was a boy with a leaden heart. he had so much homework, was so worried about homework, that he’d decided to skip the end-of-the-season soccer gorge on pasta and pizza. instead of hanging with friends, he’d decided he should come home straight after practice. to make matters a tad bit worse, i wouldn’t be home when he got there. i try hard to keep my nights away to a serious minimum, but last night was a night i’d promised to be elsewhere, in a dim-lit watering hole and song hall, actually, reading words from a page for a very fine purpose, all to raise funds for a most noble cause. i’m always torn when tugged away from my boys. and at the end of this week, this week when the lights in the kitchen never went out before midnight, because a young soccer player was trying hard to finish all of his homework, often accompanied by the sadness that lingers in our house, it was especially hard to be away. so i reached for my holy salvation: the plainly-named “Baked Macaroni and Cheese,” ala page 200. it’s a cheesy-buttery bath stirred round and through tubes of wide-mouthed pasta, each tube filling with ooze as much as being wrapped in it. it vies, in our house, with bread pudding, as the neck-and-neck nos. 1 and 2 comforts on a spoon. over the years, the making it — for me, anyway — is as soothing as it must be for my boys to polish it off in one sitting. assembling its components — the butter, the cheddar, the flour, the milk, the salt, paprika, bread crumbs, and parmesan shavings to finish it off — i slip into priestess mode. my old black cookstove — an industrial-grade contraption that somehow slipped into this old house in the 1970s, never to be removed — is my altar. i begin my incantations and prestidigitations right there, where the flame is cranked, and the concoctions in my pots begin to bubble, not unlike vats of heavenly potions. with the oven cranked to 375, the kitchen begins to warm. everything about this kitchen ritual is warming. soon, my old sweater is off, and as i stir i imagine my sweet boy coming home to find the big white ceramic souffle dish perched atop the stove, my hand-scribbled note just to the side. is there a more certain way to say i love you than to have cooked all afternoon? to have reached for the cookery shelf and pulled out the one thing a kid asks for on those nights when his sleepy head hits the pillow but the worries won’t be extinguished? 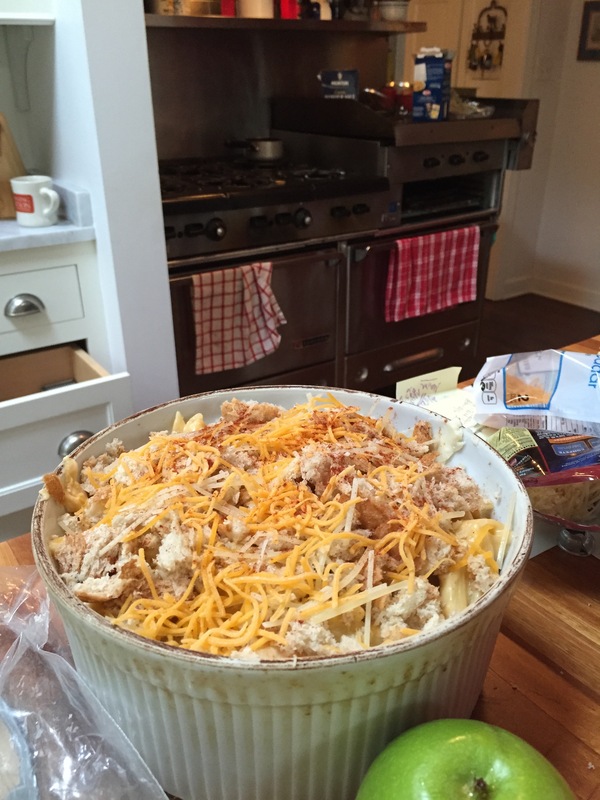 because a big old vat of mac n’ cheese wasn’t enough, not on this particular day, in the thick of this particular passage, i pulled out the produce bin and piled a mound of apples atop the cutting board. i chopped honeycrisp and granny smith, i didn’t peel — why bother? — and i tumbled the slices into the pot, added a splash of honeycrisp cider, a shake or two of cinnamon, and once again, applied flame to the equation. wasn’t long till the whole house was swimming in eau de apple and buttery-cheese. even the cat ambled back in from the garden. then i set the table. is there anything that says i was thinking of you quite so quietly, certainly, as coming home to a kitchen table that awaits you, that has your very own napkin and napkin ring at the place where you always sit? it’s the rhythms we carve into the grain of the day, of the months and the years — simple rhythms, unadorned rhythms, nothing so fancy as a napkin and fork at a place that is yours, set by someone who thought about how it might be to come home harried, and worried, and tired to the bone — that makes coming home feel as if someone just handed you your oldest, comfiest slippers. and a fuzzy sweater to boot. i’d left the stove light on, and the mac-and-cheese under a foil dome, as i slipped out the door and turned the key. then, not a block from home, i got a message: the soccer player had decided, after all, to skip coming home. he’d hang out with the soccer team, inhale store-bought pasta and delivery pizza. such is a mama’s existence. so much for stirring and chopping, in hot pursuit of healing a tattered heart. but here’s the holy truth: i was the one whose heart was soothed in the long hours of love at the cookstove. and, besides, mac-n-cheese cold makes for excellent bedtime snack. when the lights go out at midnight. what’s your when-all-else-fails cookstove concoction? When I’m sick/sad myself, and then I turn to easy peasy Campbell’s tomato soup and grilled cheese with those awful (but wonderful) prepackaged cheese slices (don’t tell my mom, the cheese snob!). you had me at “slathered over egg noodles.” i could have stopped there, but am suddenly tummy-growling for mushrooms. This time of year through about March, I fall back on summer-made pesto from Henry Brockman’s most amazing Italian basil. Recipe is in the early ’80s classic Silver Palate Cookbook, a delight to the eye and stomach. I use way more basil than called for, and up the garlic appropriately. Made sans cheeses and packed into 8-oz. plastic containers (filched from Whole Foods–don’t tell! ), they’re stacked about 15 deep in my back porch chest freezer. Saturday nights while the shell pasta is boiling, I mix the thawed pesto with some pasta water, half-and-half and a Parmesan/Romano mix, uncork our current favorite table red and, voila, instant tastes of summer in an easy, warming supper while we watch the verbal sparring on the McLaughlin Group! Heads-up for Sunday morning: High-poetess Mary Oliver will be on WBEZ’s On Being at 7 a.m.
oh, yikes, thanks for M.O. heads up!!!!!!! i will be driving to milwaukee so my sweet soccer playing can rejoin his best cambridge buddy, so mary will keep us company. Motherlove is delicious, regardless of the ingredients! you betcha. the comfort is the love and the love is in the cooking. and the love is in the welcome that is waiting. whether it is the momma herself or the you-belong-right-here-we’ve-been-waiting-for-you scene lovingly arranged to draw in and wrap around. and the love is in the food. that somebody once made for you when you didn’t even know that you needed to feel better than you felt and you savored those bites and felt better than you had and so it came to be. the mac and cheese. the chicken pot pie. the beef vegetable soup. the apple crisp. number one comfort foods. my momma’s recipe. gourmet recipes. ina’s recipes. made up along the way concoctions. that was poetry, that morning manifesto i just read, here as i wait for my comfort coffee to greet the saturday dawn. having been the one who answered the door on a dark and snowy night when you were standing there with that very chicken pot pie, i can attest: you know deeply of which you speak. and you offer it with your whole and magnificent heart. Oh BAM, you echo the pulses of my mama heart today. Last week I was pulled towards early morning commutes and “working” dinners and I tried to find ways to let my little one know just how much I love her even when 294, 355 and 55 were the magnets pulling me elsewhere at a snail’s pace. One morning my little one woke up to find that I wasn’t in bed, and she had planned in her little head, which is connected with a strong cord to her heart, that she would gently pat my back and awaken me with pure love. This is a ritual she is learning at her new preschool as a practical life skill to gently welcome friends and family from slumber. Later that day she told me on a goodnight phone call, “I dreamed that I was going to pat your back and wake you up.” And so this mama’s heart ached a bit and tried to reframe the ache to say that she knows love in her dreams. This weekend, as we sat around our dining room table, she moved her chair as close as it could possibly be to my chair and had two of her limbs touching me at all times, as if to make it clear that I belonged at this dinner table. Thank you for reminding me that these mamma hearts can receive grace from our little ones. Thank you for joining me in December for a dinner away from our little ones. and for you, i would blessedly be away for just one dinner…..
I’ve been away from the table for a bit, and now I feel like the one coming home to a warm, delectable bam-made treat.